Sometimes, trying to understand your energy bill can lead to nothing but a big headache. 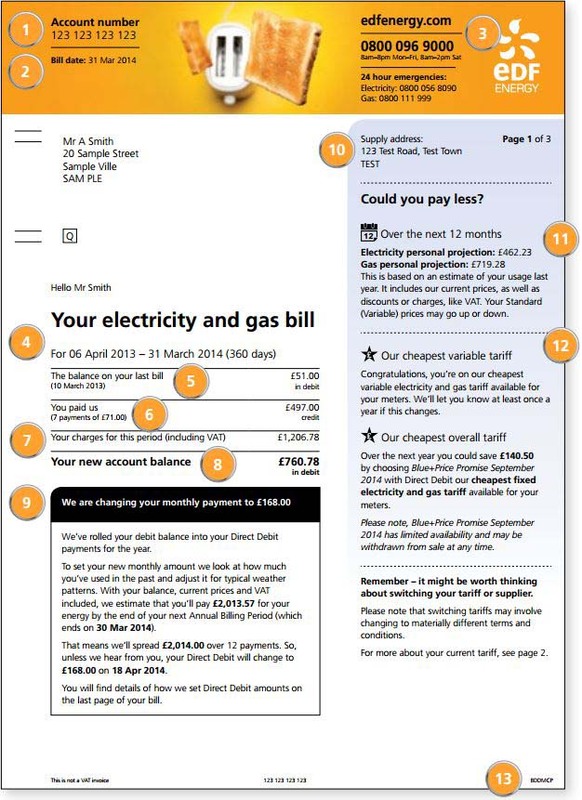 That’s why this guide aims to tell you everything you need to know about reading your EDF bill. Let’s take a look at each page of a standard bill to see what all of these details mean. Note: This bill may not be identical to yours, but you can use it as a guide for understanding your own. Your first page will contain information about your account, your current balance and anything about your credit. Underneath ‘your electricity and gas bill’, you’ll be able to find a section that is dedicated to your finances – including your balance and whether you are in debit or credit to EDF. Credit: Being in credit means you have overpaid for your energy, so your supplier owes you. Debit: Debit is the amount you need to pay on your next bill. Depending on how you pay your bills, this will either be taken automatically, or you can spend it online. Next, you’ll find a ‘QR code’ that energy companies had to include thanks to the government in 2014. 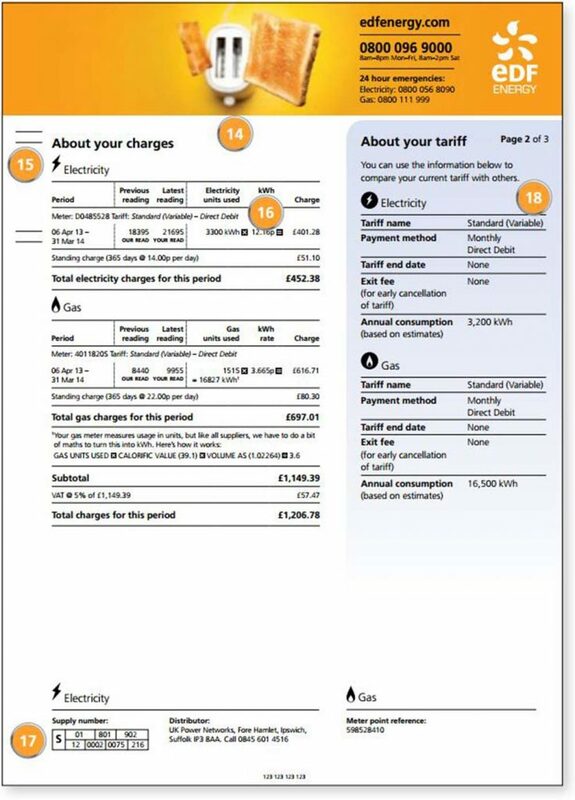 This is to give you all of the information you need about your tariff instantly so you can compare suppliers easier. Next, you’ll find information that pertains to your tariff details and your annual usage. On this page, you should be able to find information about your current plan, and whether you are on the most expensive tariff, your energy supplier offers. 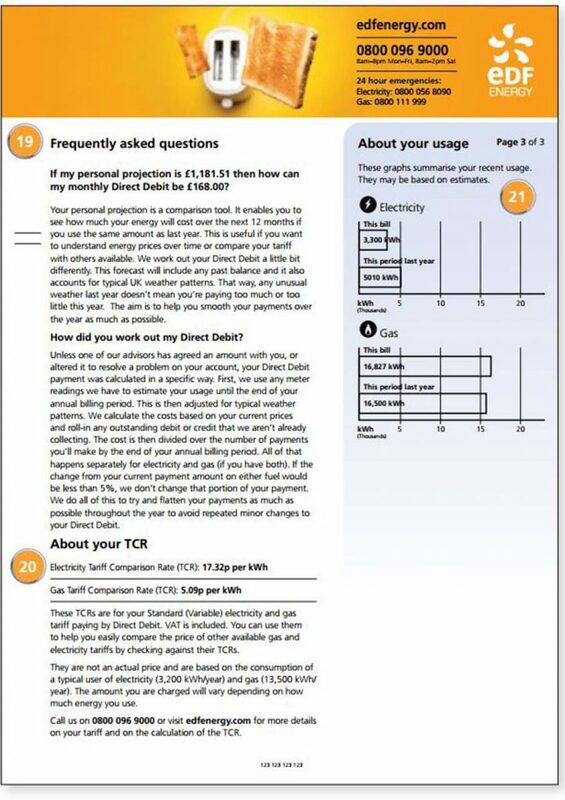 EDF’s “Standard” bill is their default variable tariff which is usually more expensive, so if you see this on your bill, you should probably consider switching energy suppliers. When comparing, you should use this information to see how much you could be saving on your annual bill. Then, you should see information regarding when your tariff is ending. This is important because often when your current tariff ends, your energy supplier will automatically roll you onto their ‘standard’ or ‘variable’ tariff. Variable tariffs are usually the most expensive plans on the market, so it’s generally advisable to avoid this by either renewing your fixed tariff or switching energy supplier. You will also be able to find out whether your plan has any exit fees. This applies when you switch energy supplier before your current contract is about to end. If you switch when you get the 42 – 49-day notice that your contract is about to end, you won’t have to pay any switching fees. Next, you can find your yearly energy usage in kilowatt hours. Finally, you will see your electricity (MPAN) and gas supply number (MPRN) which you can find at the bottom of your bill. This is like a registration number for your meter, so it’s beneficial to have on hand when switching suppliers or to contact your current supplier. Now that you know how to read your EDF bill, why not take a quick look to compare companies and see which one might be best for you. Check out Ofgem for more information about your bill. Because they may not offer the best deal for you and your home. Although you can use the quick and straightforward comparison tool at the top of the page, you should also have a look at the energy supplier guides. They will tell you everything you need to know about each energy supplier, including the tariffs they offer, their extra services and perhaps most importantly, what their customers are saying about them. This allows you to better compare suppliers as sometimes, the cost isn’t everything.